In the context of regional downscaling, we study the representation of extreme precipitation in the Weather Research and Forecasting (WRF) model, focusing on a major event that occurred on the 8th of June 2007 along the coast of eastern Australia (abbreviated “Newy”). This was one of the strongest extra-tropical low-pressure systems off eastern Australia in the last 30 years and was one of several storms comprising a test bed for the WRF ensemble that underpins the regional climate change projections for eastern Australia (New South Wales/Australian Capital Territory Regional Climate Modelling Project, NARCliM). Newy provides an informative case study for examining precipitation extremes as simulated by WRF set up for regional downscaling. Here, simulations from the NARCliM physics ensemble of Newy available at ∼10 km grid spacing are used. Extremes and spatio-temporal characteristics are examined using land-based daily and hourly precipitation totals, with a particular focus on hourly accumulations. Of the different physics schemes assessed, the cumulus and the boundary layer schemes cause the largest differences. Although the Betts-Miller-Janjic cumulus scheme produces better rainfall totals over the entire storm, the Kain-Fritsch cumulus scheme promotes higher and more realistic hourly extreme precipitation totals. Analysis indicates the Kain-Fritsch runs are correlated with larger resolved grid-scale vertical moisture fluxes, which are produced through the influence of parameterized convection on the larger-scale circulation and the subsequent convergence and ascent of moisture. Results show that WRF qualitatively reproduces spatial precipitation patterns during the storm, albeit with some errors in timing. 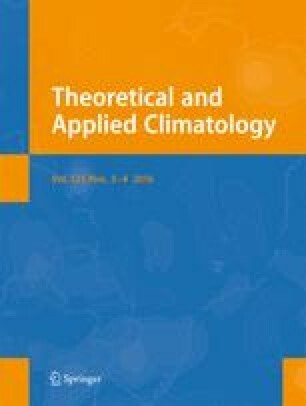 This case study indicates that whilst regional climate simulations of an extreme event such as Newy in WRF may be well represented at daily scales irrespective of the physics scheme used, the representation at hourly scales is likely to be physics scheme dependent. This work is made possible by funding from the NSW Environmental Trust for the ESCCI-ECL project, the NSW Office of Environment and Heritage backed NSW/ACT Regional Climate Modelling Project (NARCliM) and the Australian Research Council as part of the Discovery Project DP0772665, Super Science Fellowship FS100100054 and Future Fellowship FT110100576. This work was supported by an award under the Merit Allocation Scheme on the NCI National Facility at the Australian National University.